I am working on a Responsive Web App. It provides summary across different verticals. To view details of a vertical user can drill down. So far the drill down goes till level 5. The Navigation for drill down within a vertical is a variation of a Breadcrumb. Now, the need is to make changes so that the web app works fine on Mobile devices as well. I found something similar on StackExchange Is there a better solution than breadcrumbs to cascading categories on mobile? But I need something more.. Also, how should I proceed with the change? [Edit 2 - Added Possible Solution] Breadcrumb menu does seem a rational option. This is because I think that users will most often want to go bact to top and one level up - but this may be project specific as well. Not the answer you're looking for? 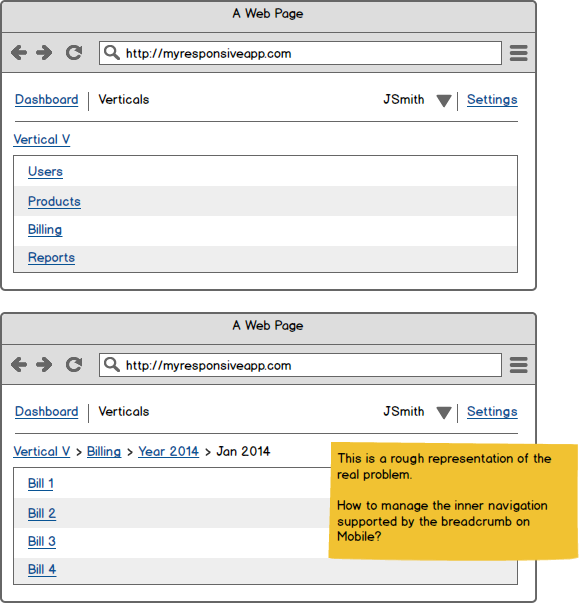 Browse other questions tagged mobile navigation responsive-design drilldown or ask your own question. 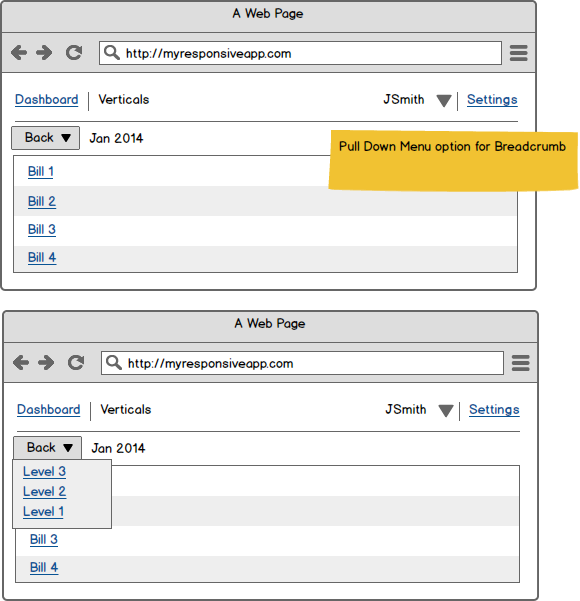 Breadcrumbs: OK to use on mobile site? Is there a better solution than breadcrumbs to cascading categories on mobile? How do I handle secondary navigation within a wizard-style form that will work for touch screens? Should a multi-step process use breadcrumbs for navigation, or a “TOC” page? Schedule on Mobile. To drill down or not to drill down?